Looking at the meaning of stones and gems, citrine is not only gorgeous in color but it also is a symbol for personal power and abundance. They are energizing and life giving, so of course they are wonderful for wearing as jewelry. 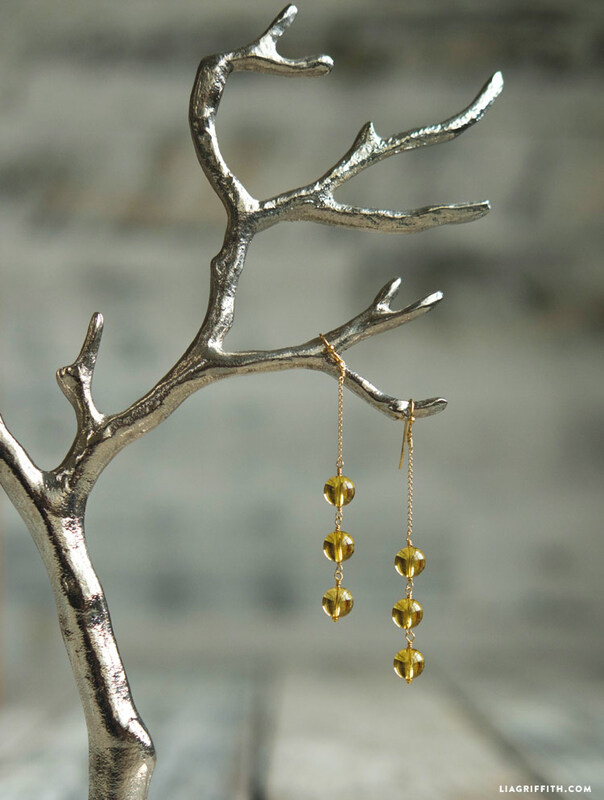 Here is a simple handmade earring project with a stunning result. 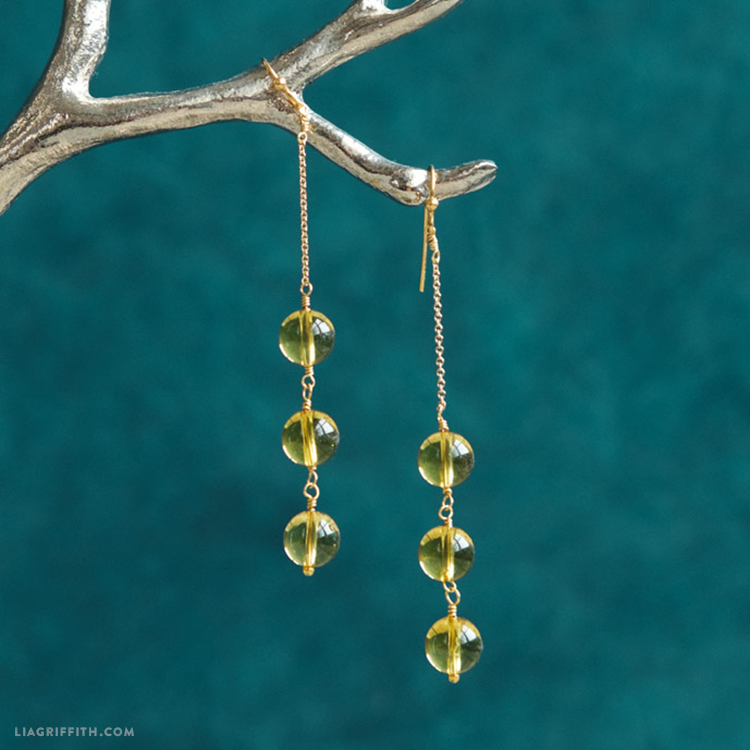 You can also use this technique with any stones that appeal to you – let this basic DIY citrine earrings tutorial inspire you! Slide the first two beads on the ball pins. Using the tip of your needle nose pliers, bend the ball pin 45 degrees above the first bead. With the round nose pliers, make a small loop to form a lollipop shape (see photo tutorial below). Hold the loop flat with pliers, then use needle nose pliers to wrap the ball pin snugly around the stem three times. Clip the end of the ball pin flush against the wrapped stem, then use pliers to flatten any sharp points. Clip a piece of 22 or 24 gauge wire, create another lollipop shape, slide looped bead into new loop and repeat wire wrap in Step 5. Slide second bead onto wire and repeat looped wire wrap steps again. Repeat to add third bead, adding one inch chain into the loop before final wire wraps. Slide your earring hooks onto the end loops of the chain. We found all of our materials for this project at our local jewelry store Dava. Easy! As we mentioned, you can use citrine or any other pretty beads. Mix and match colors, or add more beads to make the earrings longer. If you plan on making more DIY jewelry projects, we recommend investing in a full jewelry tool kit like this one we bought from Amazon. These are SO beautiful Lia!